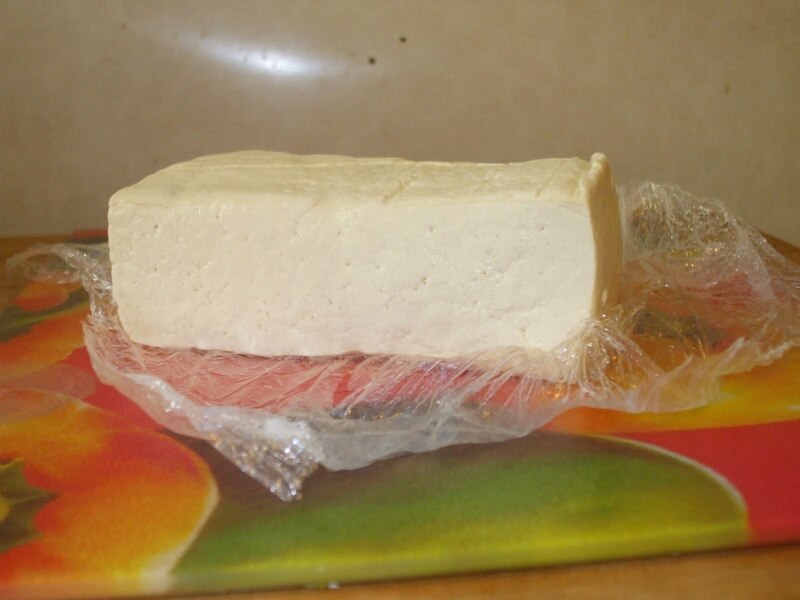 So today I get to use the fresh local tofu I bought yesterday. i know that glass cutting boards ruin my knives. If you drain, then freeze, then defrost your tofu you get a "meatier" texture, which I enjoy. 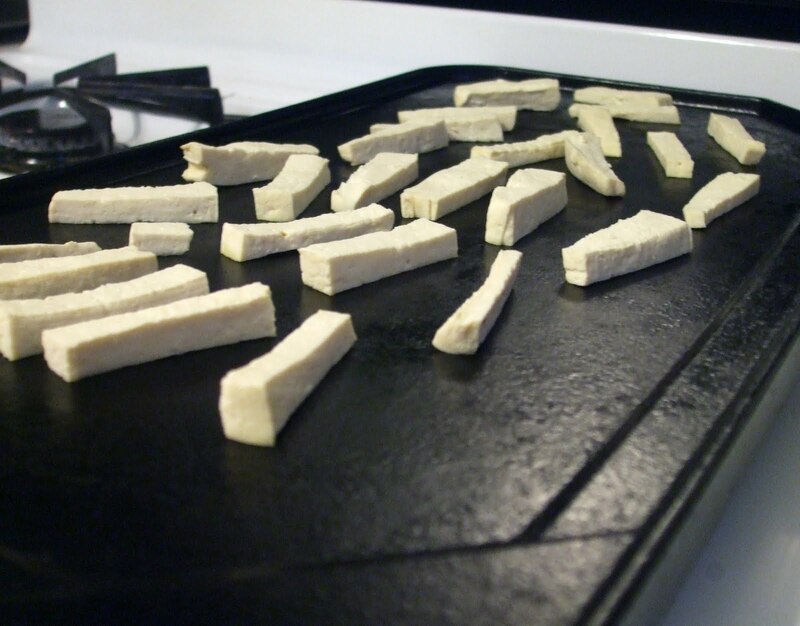 If you drain, then bake (or dry fry) your tofu, you get a drier, more absorbent tofu that takes on more of the flavors of your marinade or sauce. I didn't freeze my tofu yesterday, so I'm draining and dry frying it. 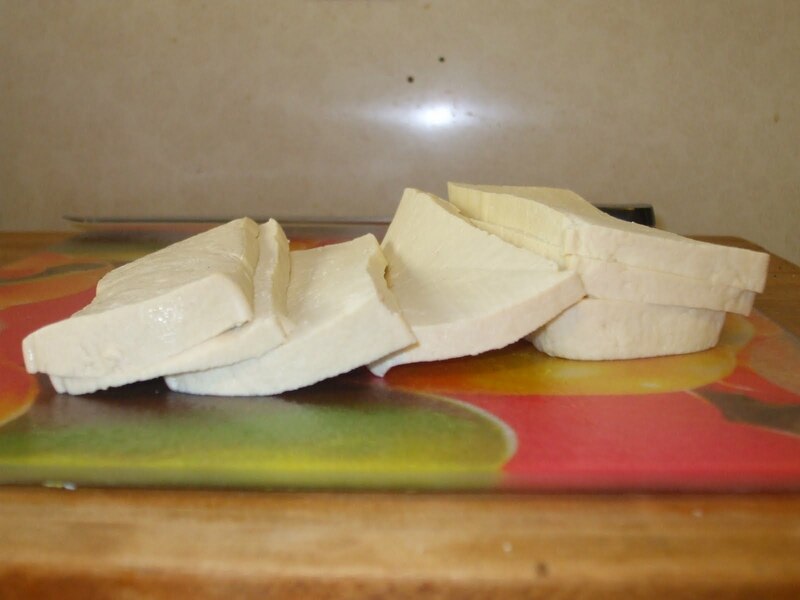 First, slice the tofu into equal thicknesses. These are like a quarter inch, if you squint. Then slice into strips, again, about equal, but we all have day jobs and do the best we can. Or the best we feel like doing. Then drain. 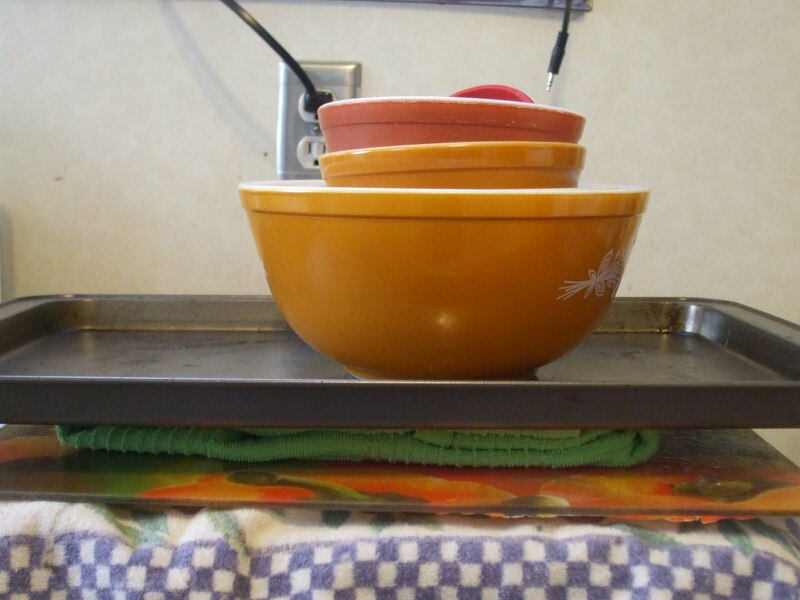 For me, draining means putting down a rack with a towel on it, laying out my tofu, covering it in a different towel, and stacking whatever heavy crap I have available on top. So here's my tofu, draining. i can't say enough about the value of vintage pyrex. So in order that's wire rack - towel - tofu - towel - heavy cutting board - bundle of tofu and towel that didn't fit in the first layer - baking sheet - vintage pyrex. But that's how I do it, I imagine your stack will look quite different. Leave it be for at least half an hour. Then "dry fry"... this means I pull out the cast iron skillet, put NO OIL down, and turn it up to medium, then put the pale tofu strips down. 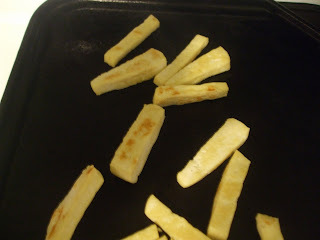 Smush them (gently) with a spatula until they scream a little (it's ok, it's just soy) and spit out some water. you may not have cast iron, fine, but don't do this in non-stick. bake at 200 for 15 minutes for a similar effect. Scooch them around a bit so they turn yellow all over and golden brown in spots. Make a marinade. I think tofu marinades are about as flexible as recipes get. For me, the math is simple, something sweet, something hot, and some filler, because that's a lot of tofu to cover. I typically go with honey, chili sauce, tamari and rice vinegar. I've used OJ for the sweet. I've used black pepper paste for the hot. I've used brown sugar. Whatever you have is fine. When I have scallions, I throw some in, other times I dice onion and garlic. Use like a cup of marinade for a pound of tofu. Marinate for at least a half hour or overnight. It's ok, you can use this time to cut up your veggies and clean up your tofu draining stack. You want your veggies to be steamed (or, ahem, defrosted). Whatever veggies you want. 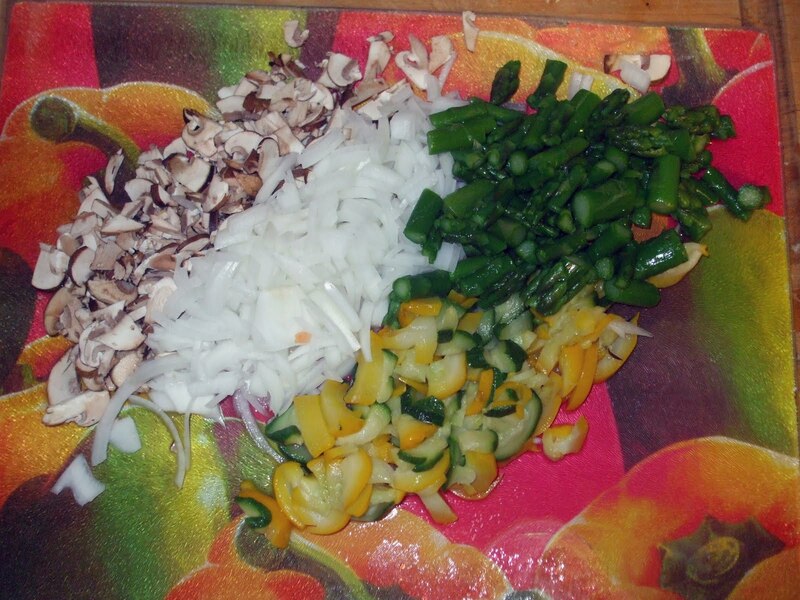 Ideally, I'd have bell peppers in the mix, but I try not to buy them in winter, I mean from Whole Foods. Ready? Ok, add onions (if you're doing onions) to a tablespoon of oil (ideally, sesame, peanut, grapeseed). Get them going and then dab with a towel to get rid of extra wetness. 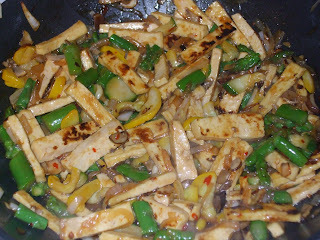 Then in with the tofu. 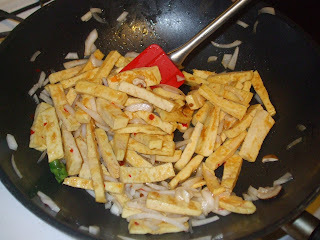 Dial it up to high and stir occasionally, leaving them in contact with your wok long enough to get some crispiness. Once your tofu is crispy, go back to your marinade and whisk in a teaspoon of corn starch. Call that a sauce. Add your veg to the wok with the sauce. Swoosh it around until everything is hot and coated. You might want to put this over rice or noodles. I didn't. 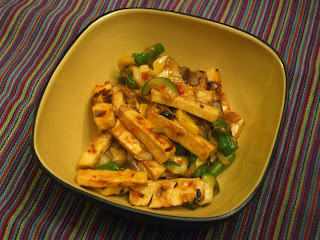 A pound of tofu makes 4-6 servings (I say 4). Maybe more with rice or noodles. yellow food, yellow bowl, when will i learn not to coordinate my dinnerware with my dinner?